High speed cutting disc ideal for stone and non-ferrous applications. The Rhodius 100mm Cutting Disc FTK44 is ideal for cutting through stone and non-ferrous materials. It features a cool-cut high cutting speed and also slices through materials easily and effortlessly. 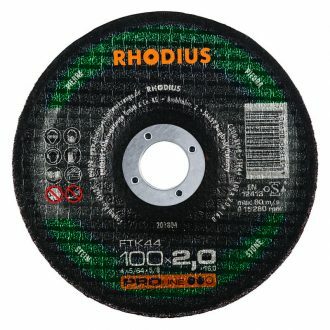 The Rhodius 100mm Cutting Disc FTK44 is a dependable freehand cutting disc that produces less edge chipping. It is versatile enough for many applications. The Rhodius 100mm Cutting Disc FTK44 is part of the PROline series. PROline Cutting Discs are for particularly high demands and frequent use in industry and trades.